The Kidz South exhibition, organised by Disabled Living, provides visitors with the chance to try out and compare the latest products and services for disabled children. This year, Kidz South presented Abacus with a great opportunity to offer visitors hands-on demonstrations for both its Aries and Gemini variable-height baths. Visitor numbers were expected to exceed last year’s show and Abacus’s Product Specialists were indeed busy throughout the exhibition, providing expert guidance in the area of assisted bathing. The Abacus range of Aquanova baths are a popular choice with Occupational Therapists and end users as they provide a safe, comfortable and versatile assisted bathing solution that can be tailored to the needs of each individual child. The height-adjustable feature of both the Gemini and Aries baths was demonstrated on many occasions at the show. This gave carers the opportunity to see how potential back and muscle strain can be avoided when bathing their child. The Gemini’s unique integrated height-adjustable platform also provides a 3-in-1 solution for changing, bathing and drying, reducing the need for any additional transfers. 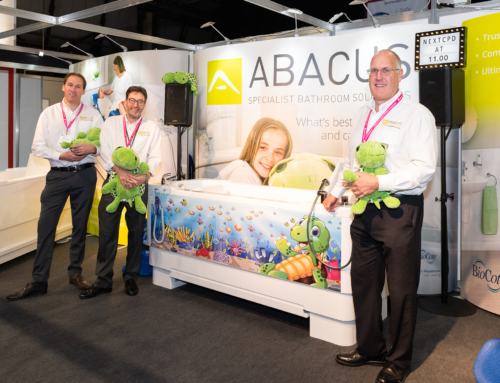 Abacus look forward to showcasing its specialist baths later in the year at the recently expanded ‘Kidz-to-Adultz-up-North’ in Manchester on 19th November. Kidz-to-Adultz will incorporate a new format with equipment and services not only relevant to children, but also to young adults up to the age of twenty-five. According to organisers, Disabled Living, “the move mirrors the recent changes in legislation with the implementation of the Children & Families Act 2014”.